An area of Central London located to the east of Tottenham Court Road, largely in WC1. The character of Bloomsbury is dominated by its residential buildings and carefully-laid out squares and gardens. Many of the buildings are part of the University of London and its federated colleges -- which, in this area, include University College London (UCL), Birkbeck, the Institute of Education, and the School of Oriental and African Studies (SOAS). 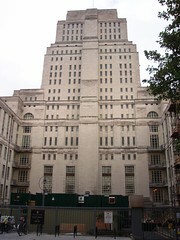 The University has its administrative headquarters in Senate House (pictured). Last edited 2009-02-03 09:45:44 (version 9; diff). List all versions. Page last edited 2009-02-03 09:45:44 (version 9).